Above is an overview of the APRS and OpenLog tracks. Click on the image for a scaleable / zoomable view in Google Maps. The APRS track was above average in quality, a combination of being close to the iGate, and low channel activity (time of day effect and one of two prominent digis has been off air for months). 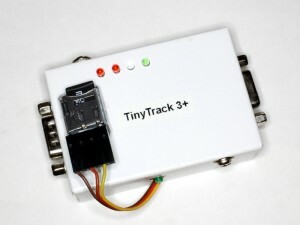 Additionally, the TinyTrak is set for more frequent reports than recommended. Most users will not experience such good APRS tracks. Inherent resolution limits of uncompressed APRS packets. Note that better APRS resolution is possible using compressed packets, but greater errors are caused by defective infrastructure that corrupts some packets with ‘non-printing’ characters (see Should you use MIC-E compression in your APRS tracker). In most cases that I experienced compressed packet corruption, it was from an iGate 300km away that got a repeated packet, corrupted it, and submitted it. Of course the corruption makes the packet unique so it escapes duplicate detection and adds a corrupt zig-zag to the mapping. 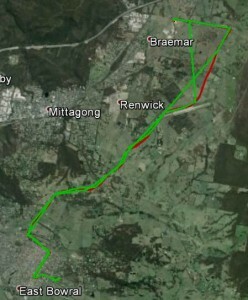 Remember that the APRS track can be much worse than in this test. The OpenLog track is more accurate and consistent, independent of radio coverage, congestion and packet corrupting infrastructure… though of course it is not real-time (or some-time as is a better description of APRS by radio). To my mind, there is a stand out case for collecting the raw NMEA records using the OpenLog data logger, particularly for documentation of a trip. On close examination, even the OpenLog track is a bit chunky, but that is mainly due to the fact that the number of points has been reduced from 3600 to 58 to reduce file size without creating more than 10m error in the track.